Standalone demonstrates how to use the QWebChannel C++ API to communicate with an external client. It is a simple chat between a C++ application and a remote HTML client running in your default browser. The C++ application sets up a QWebChannel instance and publishes a Dialog object over it. For the remote client side, index.html is opened. Both show a dialog with the list of received messages and an input box to send messages to the other end. The Dialog emits the Dialog::sendText() signal when the user sends a message. The signal automatically gets propagated to the HTML client. When the user enters a message on the HTML side, Dialog::receiveText() is called. 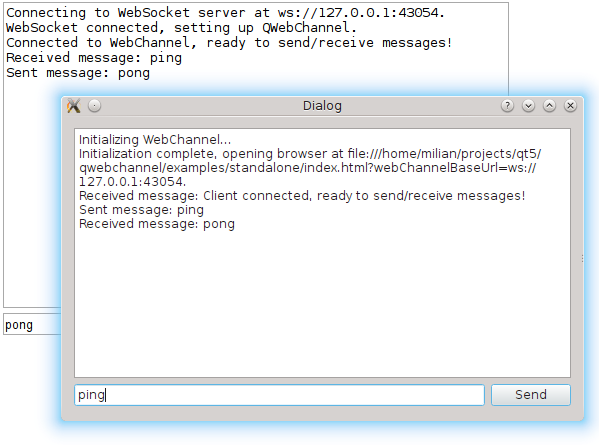 All communication between the HTML client and the C++ server is done over a WebSocket. The C++ side instantiates a QWebSocketServer and wraps incoming QWebSocket connections in QWebChannelAbstractTransport objects. These objects are then connected to the QWebChannel instance.